We get there eventually in Brighton. As the street food movement has been sweeping through the capital at a steady rate over the last couple of years, Brighton has only really started to see a few decent places which could be classed as street food crop up. We have a "proper" burger van pop up in a wood recycling centre too. Get us! 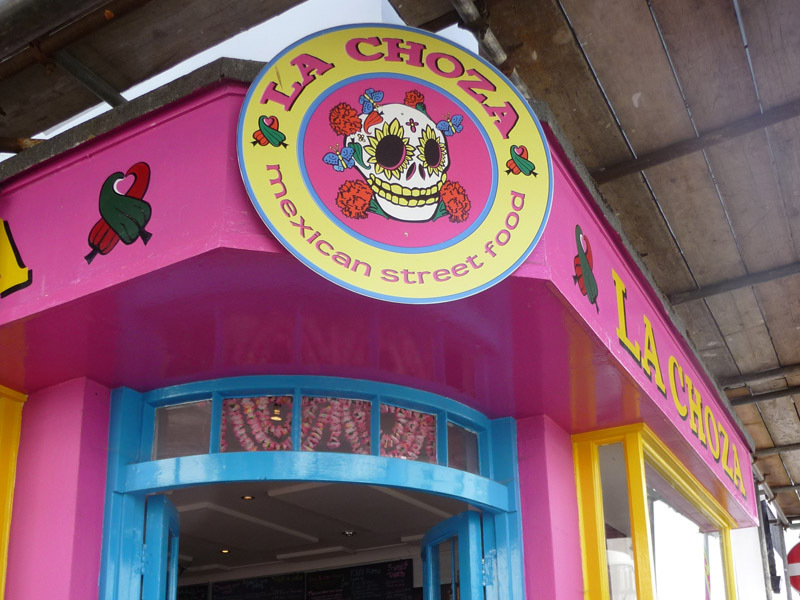 Anyway, I was particularly excited to see the arrival of La Choza, billing itself as Mexican street food with its fantastically bright Day of the Dead-esque facade, here in the North Laines. Putting it out on Twitter there were a few snotty remarks as to if a place housed in a traditional restaurant venue could class themselves as street food or whatever, but for one we don't have the street food culture and secondly, the food is street food style, does it really matter if it's not on the street? 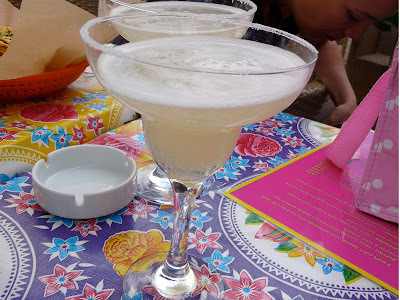 Reviews have been a bit hit and miss amongst friends but when I visited I would say it was an overall hit, and if you want a Mexican hit in Brighton, there are precious few places you can get it, and I would say La Choza would be the number one of them all. Apart from a few starters and a couple of desserts, it's pretty straightforward and streamlined. Pick a fold - Burrito, Quesadilla or Tostadas, a filling - slow cooked meats, fish or vegetarian and a salsa. So an easy decision of a Burrito with pulled pork and hot sauce it was (£6), washed down with a pretty decent Margarita (£6.50). 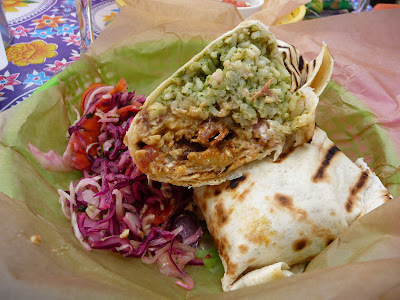 The burrito was packed with refried beans, green rice, cheese and sour cream so pretty filling and good value. Best bit was the smokey, tender pulled pork was from the BBQ Shack, (UPDATE: They now make this in-house) which means you don't have to face the dodgier end of town for a meat fix. Burritos here looked better than the ones actually at the BBQ Shack anyway so it's a win win situation. This is really nice, well priced fast food to take away or take in more slowly in the small but sweet restaurant itself. With so many offices and businesses nearby, this is sure to be a lunchtime hit. I'll be back for more on the menu for sure.